Around 15 protesters were removed during the performance after unfurling banners and PLO flags. Israel's HaBima theater company performed a Hebrew-language version of "The Merchant of Venice" before a packed Globe Theater in London Monday night, and did not let anti-Israeli protesters stop the show. The performance was arranged as part of the theatre’s Globe-to-Globe festival, in which all of Shakespeare's plays are performed in 37 different languages over six weeks. About 15 anti-Israel protesters were removed during the performance after they unfurled banners and PLO flags. There was increased security at the theater before Monday's show, and members of the audience had to pass through metal detectors and have their bags searched before entering. Small protests were held outside the theater by pro-Israel and anti-Israel groups. Ten minutes into the show, protesters unfurled PLO flags and a banner reading "Israel apartheid leave the stage" from the first-floor balcony. More banners and flags were unfurled on two more occasions before the intermission. When the play continued, a man who had been standing near the stage was removed after shouting: "Hath a Palestinian not eyes?" – paraphrasing a famous speech by Shylock in the Merchant of Venice, in which he protests the inhuman treatment of Jews. 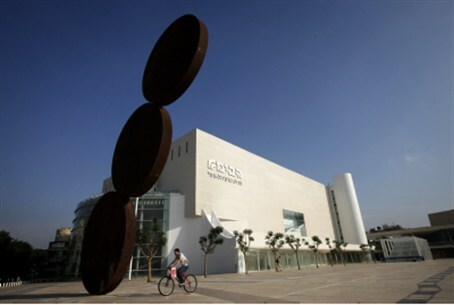 An open letter signed by several British artists in March called on the Globe to boycott Habima because of its "shameful record of involvement with illegal Israeli settlements in Occupied Palestinian Territory". Last September, protesters disrupted the Israel Philharmonic Orchestra's BBC Proms concert at London's Royal Albert Hall, causing BBC Radio 3 to interrupt its live broadcast twice. The protesters were jeered by the crowd, which cheered when they were forced out of the theater.